Magnesium deficiency is frequently associated with hypokalemia. Concomitant magnesium deficiency aggravates hypokalemia and renders it refractory to treatment by potassium. Herein is reviewed literature suggesting that magnesium deficiency exacerbates potassium wasting by increasing distal potassium secretion. A decrease in intracellular magnesium, caused by magnesium deficiency, releases the magnesium-mediated inhibition of ROMK channels and increases potassium secretion. Magnesium deficiency alone, however, does not necessarily cause hypokalemia. An increase in distal sodium delivery or elevated aldosterone levels may be required for exacerbating potassium wasting in magnesium deficiency. Hypokalemia is among the most frequently encountered fluid and electrolyte abnormalities in clinical medicine. The concentration of potassium (K+)in the serum is a balance among intake, excretion, and distribution between the extra- and intracellular spaces.1 Accordingly, hypokalemia may be caused by redistribution of K+ from serum to cells, decreased dietary intake, or excessive loss of K+ from the gastrointestinal track or from the kidney. Understandably, hypokalemia from excess renal or gastrointestinal loss or reduced intake would likely be associated with loss and deficiency of other ions. It is estimated that more than 50% of clinically significant hypokalemia has concomitant magnesium deficiency. Clinically, combined K+ and magnesium deficiency is most frequently observed in individuals receiving loop or thiazide diuretic therapy.1 Other causes include diarrhea; alcoholism; intrinsic renal tubular transport disorders such as Bartter and Gitelman syndromes; and tubular injuries from nephrotoxic drugs, including aminoglycosides, amphotericin B, cisplatin, etc. Concomitant magnesium deficiency has long been appreciated to aggravate hypokalemia.2 Hypokalemia associated with magnesium deficiency is often refractory to treatment with K+. Co-administration of magnesium is essential for correcting the hypokalemia. The mechanism of hypokalemia in magnesium deficiency, however, remains unexplained. Here, we review existing literature on the subject to provide better understanding of the mechanism. Because of space limitations, this review cites review articles in lieu of many original publications. What is the cellular mechanism for the decrease in K+ secretion by magnesium? In the late distal tubular and cortical collecting duct cells, K+ is taken up into cells across the basolateral membrane via Na-K-ATPases and secreted into luminal fluid via apical K+ channels. Two types of K+ channels mediate apical K+ secretion: ROMK and maxi-K channels. ROMK is an inward-rectifying K+ channel responsible for basal (non–flow stimulated) K+ secretion.11 Inward rectification means that K+ ions flow in the cells through ion channels more readily than out.12 Sodium (Na+) reabsorption via epithelial Na+ channel (ENaC) depolarizes the apical membrane potential, which provides the driving force for K+ secretion. Aldosterone increases sodium reabsorption via ENaC to stimulate K+ secretion (Figure 1). Maxi-K channels are responsible for flow-stimulated K+ secretion (data not shown). Inward rectification of ROMK results when intracellular Mg2+ binds and blocks the pore of the channel from the inside, thereby limiting outward K+ flux (efflux). 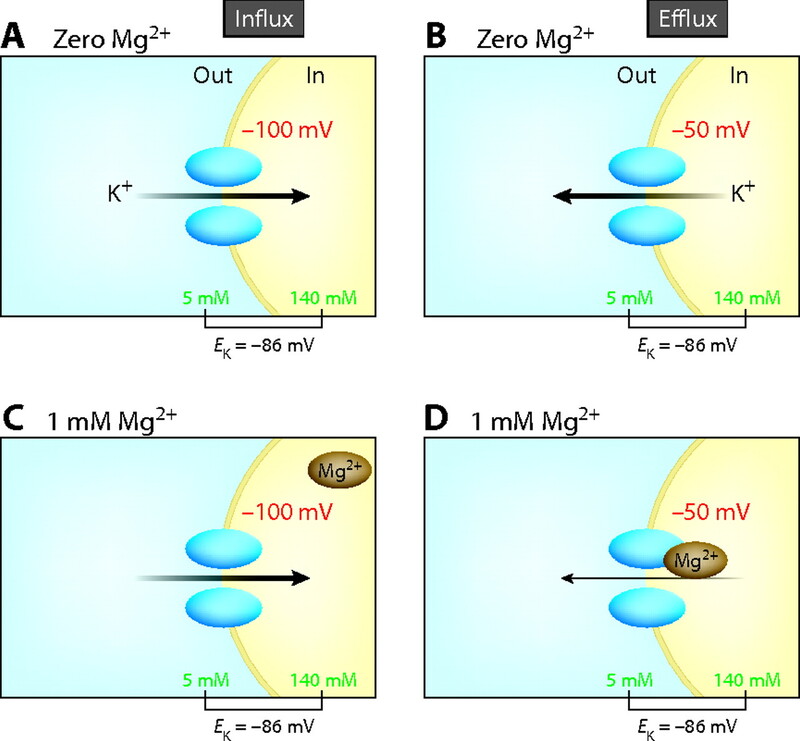 Inward K+ flux (influx) would displace intracellular Mg2+ from the pore and release the block (Figure 2). The concentration of intracellular Mg2+ required for inhibition of ROMK depends on membrane voltage and the extracellular concentration of K+.13 At the physiologic extracellular K+ and apical membrane potential in the distal nephron, the effective intracellular concentration of Mg2+ for inhibiting ROMK ranges from 0.1 to 10.0 mM, with the median concentration at approximately 1.0 mM.13 The intracellular Mg2+ concentration is estimated at 0.5 to 1.0 mM.14 Thus, intracellular Mg2+ is a critical determinant of ROMK-mediated K+ secretion in the distal nephron. Changes in intracellular Mg2+ concentration over the physiologic-pathophysiologic range would significantly affect K+ secretion. Several genetic disorders of magnesium homeostasis have magnesium wasting without concomitant K+ wasting.17 These include familial hypomagnesemia with hypercalciuria and nephrocalcinosis, caused by mutations of a tight-junction protein Paracellin-1 in the thick ascending limb of Henle's loop, and hypomagnesemia with secondary hypocalcemia, caused by mutations of the magnesium channel TRPM6.18,19 In these genetic diseases of magnesium transporter disorder17–19 and experimental models of isolated dietary magnesium deficiency,4,10 serum K+ levels and urinary K+ excretion are normal. How do these findings reconcile with the proposed model that lowering intracellular Mg2+ increases ROMK-mediated K+ secretion in the distal tubules? One reason for the lack of significant hypokalemia and K+ wasting in isolated magnesium deficiency is related to the impairment of Na-K-ATPase. Decreased cellular K+ uptake in the muscle and the kidney would tend to maintain serum K+ levels but decrease renal K+ secretion4,10; therefore, additional factors are needed for promoting renal K+ excretion. Another reason is related to the fact that ROMK channels in the apical membrane of distal tubules also play an important role in regulating membrane potential.11 An increase in the K+ secretion would hyperpolarize membrane potential (as a result of loss of intracellular positive charges), which decreases the driving force for outward K+ flux and ultimately limits the total amount of K+ secretion; therefore, a mere increase in ROMK activity from a low intracellular Mg2+ may not be sufficient to cause a significant K+ wasting. Additional factors that would provide an unabating driving force for K+ secretion (i.e., prevent apical membrane hyperpolarization), such as an increase in distal sodium delivery and elevated aldosterone levels, are important for exacerbating K+ wasting in magnesium deficiency (Figure 3). One or both factors are present in diuretics therapy, diarrhea, alcoholism, Bartter and Gitelman syndromes, and tubular injuries from nephrotoxic drugs. Magnesium and K+ are the two most abundant intracellular cations. Because of their predominant intracellular distribution, deficiency of these ions is underrecognized. Both magnesium and K+ are critical for stabilizing membrane potential and decreasing cell excitability.16 Magnesium deficiency will not only exacerbate K+ wasting but also aggravate the adverse effects of hypokalemia on target tissues.16 Recognition of concomitant magnesium deficiency and early treatment with magnesium are imperative for effective treatment and prevention of complications of hypokalemia. C.-L.H. is supported by grants from the National Institutes of Health (DK54368 and DK59530) and the Jacob Lemann Professorship in Calcium Transport at University of Texas Southwestern Medical Center and is an established investigator of the American Heart Association (0440019N). We thank Drs. Michel Baum, Orson Moe, Charles Pak, and Robert Reilly for critical reading and comments on the manuscript.